In the sometimes predictable world of stand-up comedy, ventriloquist Paul Zerdin is a true breath of fresh air, bringing a whole tribe of characters to accompany him on stage and bringing them to life with a whole bucketful of laughter to boot. 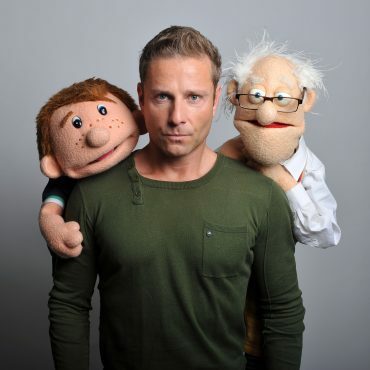 Paul Zerdin is without doubt the UK’s most accomplished and well-known ventriloquist act, but also brilliant actor, straight and all-round top class comedian. And this is no 1970s' ventriloquist tribute act either. This is fresh and modern character comedy at its best. The actual ventriloquism is second to none, but it is the warmth of the characters from mischievous side-kick Sam through cantankerous old man Albert to a naughty baby and even a talking matchbox (oh yes) that make them far more believable than simple puppets. Add to that an acting ability and the sharp wit of a true comic and you have the perceft recipe for mirth. The maiden winner of ITV's Big Big Talent show in 1996, Zerdin is a favourite of the royal family, having been asked to appear for comedy loving Prince Charles at the Prince's Trust 21st anniversary gala. Comic Paul Zerdin followed that by stealing the show at the 2002 Royal Variety Performance. It was that performance which brought him to the attention of the king of puppetry, Jin Henson, to work on the film Muppets Treasure Island, and won him appearances alongside Bruce Forsyth on ITV's Tonight at the London Palladium with Bruce Forsyth and Shirley Bassey's 60th Birthday Special, where Sam sang back at the great dame in truly great comedy moment. Paul Zerdin’s 14th year in pantomime in 2008, saw him star alongside John Barrowman in the record-breaking Robin Hood at Birmingham Hippodrome. But while Paul Zerdin doesn't mind doffing his cap for Charles, Bruce and Captain Jack at such big stage variety shows, Zerdin is equally happy at home on the smallest comedy club stages. In fact he is almost made for them as it allows the audience to truly get to know and love his characters and see up close his unbelievable comic talent. , comic Paul Zerdin first started out as a magician at the age of 15 and, after ruining his GCSE’s, decided that the only thing he could do was to go into show business. For the next five years he appeared up and down the country on the club and holiday camp circuit honing his magic while slowly introducing his stand-up comedy and ventriloquism. At the age of 20 he landed his first proper TV job as presenter on GMTV’s children’s programme ‘Rise and Shine’. On television, he has worked, again with Brucie, on BBC1’s Generation Game, Late Night With Jerry Springer, and become a favourite of the daytime shows like Today with Des and Mel and Open House, with Gloria Hunniford, as well as Sky TV's more respectful Undercover Magic. He’s starred in TV commercials, too, for Kellogg’s, Persil and Honda, and has entertained British forces in Iraq and Afghanistan. Top stand-up comedian Paul Zerdin’s stage shows include sell-out summer shows at the variety Mecca that is Blackpool, an acclaimed run with his show Paul Zerdin - No Kids at the Edinburgh Comedy festival as well as shows in Las Vegas, Cape Town, Shanghai and Beijing. Paul Zerdin is in a league of his own. You can’t help but to be won over with this set which is not just polished but very well-constructed. The conclusion is pure audience-gratifying magic. Every now and then you stumble across a finished article, a show so polished it shines. Paul Zerdin: Sponge Fest is one of these shows. A ventriloquist at the top of his game, Zerdin is so sure of his skills and so in control of his material that he isn’t just performing – he’s showing off, clearly having as much of a laugh as his audience.